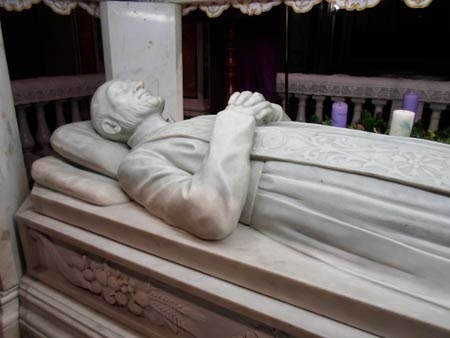 *A wooden statue of St Alphonsus Liguori rests under an altar to the left of the main sanctuary. This statue is so life like that at first glance one may think that the entire body of St Alphonsus Liguori is incorrupt. However, this is not the case. Some relics of the saint, nevertheless, are present. They rest on a silver carriage below the wooden statue. *Tradition claims that St Andrew was martyred and buried in Patras, Greece. Later most of his relics were relocated to Constantinople. Following the sacking of this city in 1204 AD they were transferred to Amalfi, Italy and placed within this church. Most of these relics remain here today and are located within the crypt below the main altar. According to the Roman Martyrology St Bartholomew suffered martyrdom in the Roman province of Armenia. It is recorded that he was first skinned alive and then put to death by decapitation. 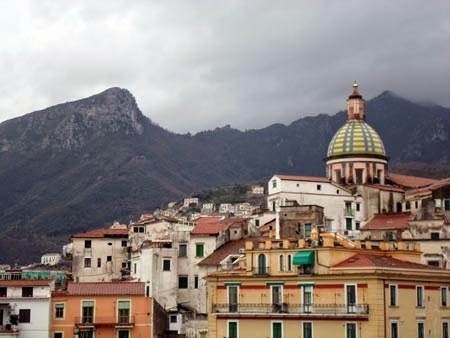 Five centuries later and half-way across the Mediterranean his relics were found in Lipari, Sicily. Most likely they arrived here through normal means; however, a pious tradition contends that this transfer occurred miraculously. This tradition claims that the sarcophagus of St Bartholomew was thrown into the sea by infidels. It then floated upon the water until it finally and miraculously came to the shores of the tiny island of Lipari. Regardless, how the relics arrived they remained on this island until the middle of the 9th century. 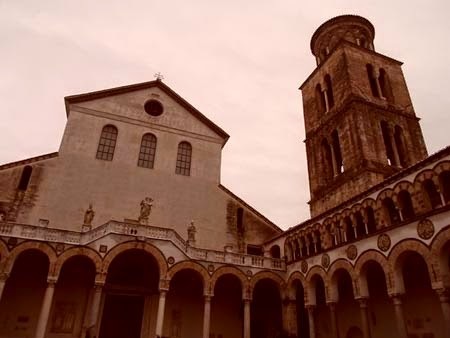 At this time they were transferred to Benevento, Italy and then in the latter part of the 10th century they were brought to Rome by the Holy Roman Emperor, Otto III, where they were interred in the church of San Bartolomeo all’Isola on Tiber Island. This final transfer, however, is contested by the city of Benevento which continues to claim possession of the true relics of St Bartholomew. 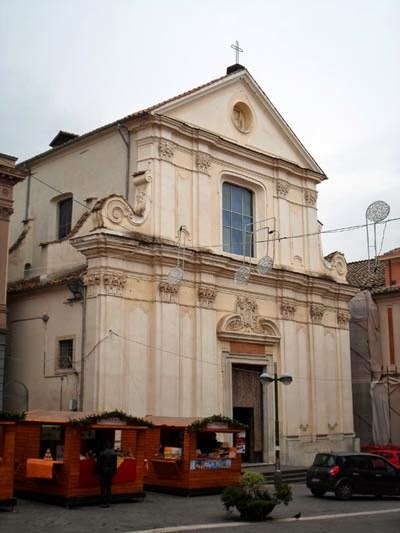 *As noted above the tradition in Benevento holds that the relics of St Bartholomew remain within this church. An exhibit near the front of the church portrays a recent analysis of these relics and provides support for this claim. Also a monument upon the side-wall recalls the 2001 declaration by St John Paul II which reopened the cult of St Bartholomew in this church. *The relics of St Bartholomew rest within a porphyry urn below the main altar. An additional bone fragment is placed within a bust of the saint. Twice a year, on August 24th and October 25th, the city celebrates his feast. *Despite being the legitimate pope, St Gregory VII was forced out of Rome in 1084 as a result of his ties to the Normans and the political pressures created by the Holy Roman Emperor, Henry IV, and the antipope, Clement III. A year later St Gregory VII died in Salerno as an exile. His remains now rest under an altar in the right transept of this church. *The relics of St Matthew were brought to Salerno in 954 AD. This event is celebrated annually with a festival on May 6th. His relics are preserved within the richly decorated crypt of this church. *The remains of St Joseph Moscati rest within a tomb placed within the second chapel on the right side of the nave of this church. In life he was a medical doctor and researcher who practiced great charity in his profession. In particular he was known to never charge the poor for his services. A museum just a short distance from his tomb preserves his memory. Within this museum are both the bedroom in which he died and his study. Also preserved here are many of the medical instruments that he used in life. *Annually on June 22nd crowds of people fill the square in front of this church to celebrate the feast of St Paulinus. A silver bust of the saint is processed into the crowd and eight festive obelisks and an ornamental wooden boat are blessed. The obelisks and boat harken back to a legendary story of the saint. It is said that as Barbarian tribes were invading Italy, St Paulinus offered to be taken captive in exchange for the return of a widow’s son. This action of selfless love is said to have so impressed the leader of this invading party that he chose to grant St Paulinus his freedom. St Paulinus then returned to Italy and was warmly welcomed by the people of Nola. *Apart from this celebration relics of St Paulinus rest within this church in the fourth chapel on the left side of the nave. The remains of St Philomena were found in 1802 in the Catacombs of Priscilla in Rome. In 1805 they were transferred to the following church in Mugnano del Cardinale, Italy. *The remains of St Philomena rest within this church in the second chapel on the left side of the nave. They are placed within a life-sized paper mache reproduction of her likeness that rests above the altar in this chapel. *St Thomas lived in this priory from 1272-1274. 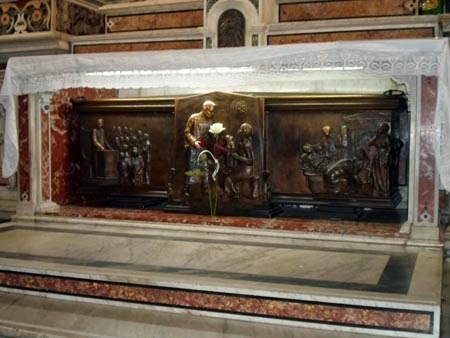 Within the cell in which he lived is preserved the miraculous crucifix that exclaimed, “You have written well of me, Thomas.” Also within this same cell is preserved a bone from his left arm. Access to this cell is only given by special permission. *This church marks the spot of St Agatha’s final suffering. It was here that she was placed into a furnace and martyred. *The relics of St Agatha are located within the apse of this church in the Chapel of St Agatha. Unfortunately, this chapel is not accessible to the public. However, every year on February 4th and 5th the relics are brought out and the faithful are given the chance to participate in the procession of her relics through the streets of Catania. 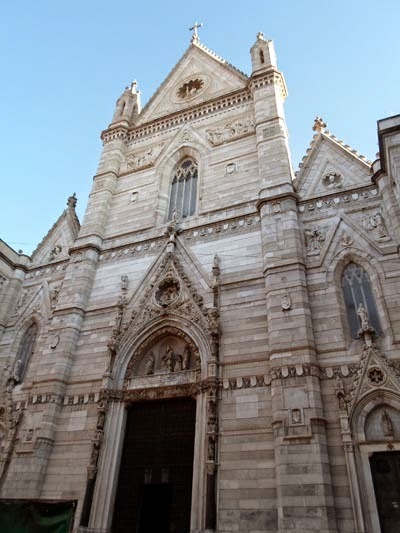 *This church is just behind the church of Sant’Agata alla Fornace (listed previously) and is considered to be the site of St Agatha’s imprisonment. Also two lava slabs within this church show the imprints of St Agatha’s little feet. *A relic of the thumb of St Bartholomew rests within a silver arm reliquary in this church. This relic is exposed for veneration during feast days of the saint. *The remains of St Bruno rest within the main sanctuary of the church at this monastery. He lived here for ten years following the establishment of this monastery. *The innards of St Louis rest within an urn in the left transept of this church. These relics were acquired during the transfer of St Louis’ body from Tunis to Paris. 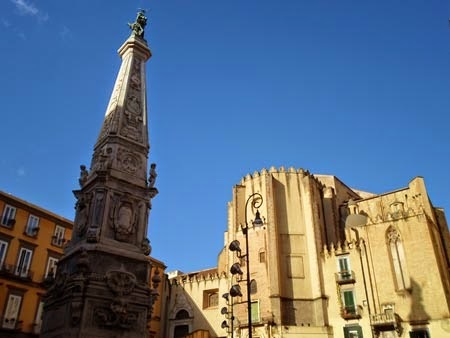 The Sicilian city of Syracuse lost most of its relics of St Lucy through the transfers carried out by Faroald II and Giorgio Maniace during the 8th and the 11th centuries. Therefore, the following relics have been at various times returned to the city. *Relics of St Paulinus of Nola are said to rest within an urn in this church. They are carried in procession annually on the Tuesday after Easter. *This shrine claims to have received its relics of St Paulinus of Nola in 1336. It is believed that they came from the remains that had been at San Bartolomeo all’Isola in Rome, Italy. A tradition holds that in the 3rd century the bones of St Thomas the Apostle were taken from India and brought to Edessa, Turkey. In 1258 these remains were transferred to Ortona, Italy. *The relics of St Thomas the Apostle rest within a golden casket placed within a white marble altar located in the crypt of this church.